The 11 Best Doughnut Shops in New York! Whether they’re sugared, glazed, or filled, doughnuts will always have a special place in the hearts of New Yorkers. From creative flavor takes to gourmet doughnut experiences, here are the 10 best doughnut shops in New York State! A capital-region obsession, Cider Belly Doughnuts focuses on fresh, delicious doughnuts in flavors like cider, maple, and cappuccino. The café doles out doughnuts in quantities from one to a dozen. Soft, moist, and fluffy, Dough Donuts have been a cult favorite in New York City since the bakery was founded in Bed-Stuy in 2010. Dough places an emphasis on flavor innovation, making varieties such as hibiscus, Nutella, and passion fruit, among others. Doughnut Plant produces fresh, savory, organic-when-possible donuts daily from all of its colorful locations around the city. Expect cake, yeast, and filled doughnuts in flavors like banana pecan and peanut butter and banana cream. Making what “could be the best donuts on the planet,” Donut Kraze pushes the envelope when it comes to creativity. The doughnuts are very light but packed with sweet and savory toppings, like bacon and strawberry cheesecake. Neat, perfectly round, and glazed to perfection, the doughnuts at New York City doughnut darling Underwest have amassed a significant fan following. Zany flavors include carwash (vanilla and lavender), halva, and jasmine green tea. Run by a pair of high school sweethearts who started dating in 1981, Regional Donut Authority seeks to bring back some of that old-school charm with its tasty, colorful doughnuts. That said, Regional Donut Authority is not afraid to experiment with wacky-yet-delectable toppings like Froot Loops and candy cane pieces. This New York City doughnut maker churns out delightful bite-size doughnuts with an emphasis on quirky flavor profiles. Buy a pack of six and mix-and-match as you please, choosing from flavors such as fruity cereal and pumpkin pie brulee. Supported by a loyal following of Buffalonians, Paula’s is a household name in the region. 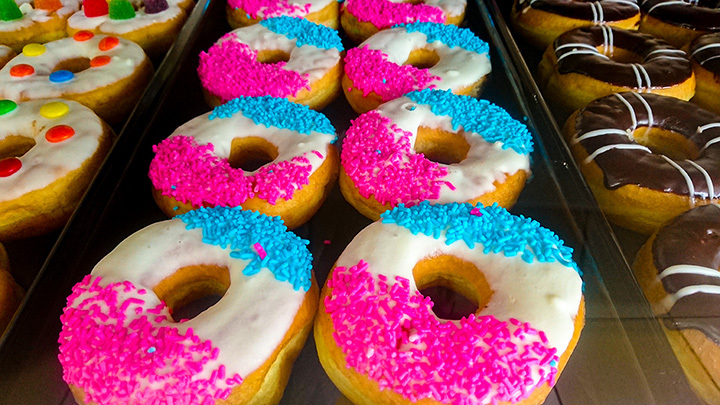 The bakery serves up colorful, dense, and rich doughnuts in glazed, jelly, Bavarian, and angel cream, among others. Simple, fresh, and old-school, The Donut Pub focuses on what it does best—the all-American classic doughnuts for reasonable prices. Try the chocolate caramel croissant or blueberry cake flavors. With decadent, gourmet doughnuts slathered in all manner of tasty toppings, Nibble encourages capital-region adults to indulge their little-kid sweet teeth. Dun-Well Doughnuts was created by Christopher Hollowell and Dan Dunbar after the two were unable to find a vegan doughnut shop in the city. So they opened up Dun-Well Doughnuts—New York City’s first vegan doughnut shop and arguably the best (of any doughnut shop!) in the city. Stop in to check out their delectable creations!